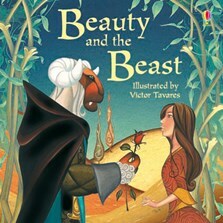 A gorgeous picture book retelling the classic tale for younger children. The Beast lives alone in his castle, enchanted by a wicked fairy and waiting for true love to break the spell. Could Beauty be the one to see through his ugly exterior? The simple and engaging text is accompanied by sumptuous illustrations by Victor Tavares. A superb and darkly rich version of this fairy tale classic.